Rick Scott is an award winning singer, songwriter, storyteller and actor who combines music and laughter in lively, participatory concerts for all ages. His gift for combining wacky humor and poignant human commentary has earned him a devoted following from four generations in nine countries. Over 35 years he has performed over one thousand shows in schools, festivals and concert halls in Canada, the US, Australia and Southeast Asia. He’s Goodwill Ambassador for the Down Syndrome Research Foundation. Rick has released 17 albums including seven children’s CDs honored with three Juno nominations and Parents’ Choice, NAPPA Gold, iParenting Media, Children’s Music Web and Canadian Folk Music Awards. In fall 2012 Rick released THE GREAT GAZZOON – a 4 CD musical audio novel co-written and produced with Valley Hennell and illustrated by Linda Sanborn, with financial support of the Canada Council for the Arts and FACTOR. 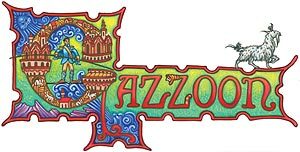 THE GREAT GAZZOON is a folk tale told by a folkie, the story of how one boy’s love of music transforms his community. and innovative. It’s funny, clever and warm. It’s not only important to Canadian music—it’s essential." "Rick teaches with such an entertaining flair that kids don’t mind that they’re learning." to be growing younger to the heartfelt stories and songs of this ageless elder man boy." of life clearly moved conference delegates. His talent and ability to teach others to fly is a gift." "I cannot even begin to express the impact your visit has had on the children of our school! They are singing and dancing all the time now! They are twirling and rapping on the playground! Really, a wonderful transformation has come over them! They are so proud of their songs and grade 6 says 'Rick Scott day' was one the highlights of their grad year! Thank you for showing us the wonder of music! We look so forward to planning our next event with you!"